CSM Live creates and delivers award-winning brand and live experiences around the world. As well as delivering world-class branding solutions for venues and host cities for the likes of FIFA, Ryder Cup and Formula E, we also create engaging activations to help bring sponsorship to life. Sponsorship activations, when done well, engage the target audience in compelling ways by interacting with people’s emotions. We use our vast knowledge, expertise and in-house production capabilities to define, design and deliver award-winning experiences with impact. Our work connects brands with rights holders and the people that matter to them and through these connections, we help invent new revenue streams, create more extraordinary experiences and deliver richer, deeper and more impactful engagement. gifts, trophies and awards to your requirements. Inkerman is the designer and sponsor of the 2019 UK Sponsorship Awards. 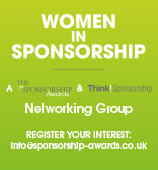 Specialist Speakers, the speaker bureau, is delighted to support the UK Sponsorship Awards. For the third year we present the wonderful Viv Groskop, writer, broadcaster and comedian, as our host for this evening. A regular on the Edinburgh Fringe, Viv is a presenter on BBC Radio 4 and writes on arts, TV and culture for the Guardian and Observer as well as for The Times, Telegraph, Independent and Financial Times. Her book on stand-up, I Laughed, I Cried, was an Amazon Comedy No.1 bestseller. Viv’s most recent publishing success is The Anna Karenina Fix: Life Lessons From Russian Literature, published by Fig Tree. Sponsorium offers PerforMind™ as a software-as-a-service product you access through the Cloud. PerforMind™ is the most effective, robust sponsorship and community investment evaluation solution in the market. International Panel of 6 million. Brand, League & Event Perception.